This expert handbook explores how server virtualization can increase flexibility, while ensuring that recovery time objectives are met and hardware requirements stay minimal. Compare how physical and virtual DR differ and learn about the benefits and drawbacks of a virtual disaster recovery strategy. 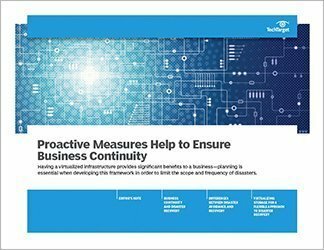 Plus, find out how you can emphasize disaster prevention over DR to minimize downtime. Learn about the latest in virtual disaster recovery, get advice from our experts, and learn about the pitfalls to avoid in this expert handbook.